Rising and falling tonal layers fuse into a continuum that seems to lift the listener out of perceptual linearity, expanding space into a perpetual metamorphosis of form. Within its minimalist structure, Chapter 3 weaves intricate complexities that create a weightless veil of vibrating resonance. An amplified silence allows for intimate reflection, evoking both deep peace and a heightened awareness. In the end, the listener returns to the source from which these sounds were born - silence. 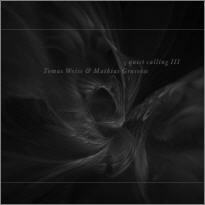 "I received this wonderful album ("Quiet Calling III") after having already heard it as part of a radio broadcast one day earlier. I admit, after listening to several albums by Klaus Schulze, Tangerine Dream, Jean Michel Jarre, Diatonis, Steve Roach, Vangelis etc., I have never felt as much emotion in them as in the el culto albums "Aestrata", "Farewell" and particulary "Quiet Calling III". It's no longer simply a question of closing one’s eyes and imagining a world without limits. They are magicians of the soul and it seems that the music never ends! I can immerse myself in the vastness of the universe in a way that is complementary to my astronomical observations, and this time I can continue my journey with one eye shut. Since my childhood, for 46 years now, my eyes have been turned towards the sky while listening to immeasurable albums by the above-mentioned artists, but Tomas’ and Mathias’ music feels like the ultimate experience to me! In my opinion, this album is absolutely perfect, how will they be able to create something greater it in the future?